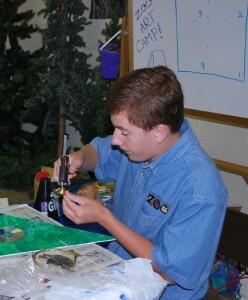 Summer Camps provide children (ages 5–13) the opportunity to spend the summer outside at the zoo learning about animals, zoos, and wildlife conservation. Activities include animal presentations, games, crafts, stories, and more! There is something for every child. Advanced registration required. Mammals that can fly? No way! Immerse yourselves in the amazing world of bats! Learn how they fly, communicate, and thrive in the dark! All animals need food. Discover the amazing chemistry of food and how animals can digest some weird things. Investigate the amazing engineering of animal anatomy. Create anatomically correct monsters, build robots, and more! For more information or to make a reservation for Summer Camps, please contact us.